Small group of radical anti-Zionist sect stand in solidarity with Jobbik party head during controversial London rally. When Gábor Vona, the leader Hungary's far-right Jobbik party, made his controversial visit and public address in London on the eve of International Holocaust Remembrance Day, he faced protests by anti-racism and anti-fascist campaigners, who said he should never have been allowed into the UK in the first place. 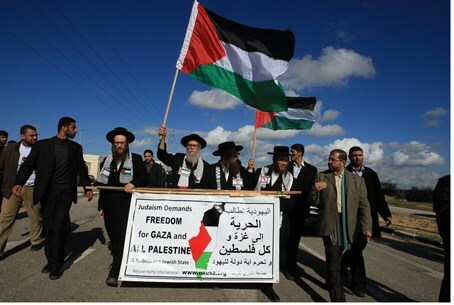 But Vona also received support during his visit - including from Neturei Karta, a radical Jewish anti-Zionist sect. Pictures of several Jewish men wearing traditional hassidic garb protesting in support of Vona and his Jobbik party were first circulated by the BBC - although the British media outlet initially erroneously claimed the group were protesting against his visit. The confusion likely stemmed from the apparently bizarre spectacle of supposedly religious Jews supporting a figure who has been compared to Adolf Hitler for his party's extreme xenophobia. Jobbik has been branded anti-Semitic and racist for its views targeting the country's Jewish and Roma minorities, and blamed for an increase in racism and anti-Semitism in the Eastern European state. The party notably makes use of several Nazi symbols, including the Árpád stripes, which were initially used by the Hungarian Nazi Arrow Cross, which collaborated with Nazi Germany and was instrumental in the deportation and murder of 400,000 Hungarian Jews. But Jobbik's hatred for the State of Israel is precisely the reason why Neturei Karta turned up in support. Angered by the implication that it was opposed to the far-right party, Neturei Karta lodged a complaint with the BBC, accusing it of "distorting our message", after which the picture was removed. On its Facebook page, the radical sect - which numbers no more than a few hundred and has been disowned by all mainstream Jewish sects - posted a status clarifying that its members were indeed there to support Jobbik. "Members of Neturei Karta were demonstrating against the strident and aggressive actions of the Zionists against Jobbick [sic] and Mr. Vona," it said, referring to anti-racism groups opposed to the visit. "The Rabbis of NK were carrying a banner with a clear message: 'Authentic Jewry is Against Zionist Aggression'." "The BBC ignored the banner and totally distorting [sic] our message. They stated that the Rabbis were there to demonstrate against Mr. Vona and Jobbick. That is totally false. "I have lodged a complaint with the BBC and await the outcome." Those familiar with Neturei Karta point out that its stance is far from surprising, since the sect's relationship with extremist groups - from the far-right to Islamists and the far-left - is nothing new. "Neturei Karta has always been an important partner for far-Left and Islamist groups in the UK, who have cited the support of Neturei Karta as a fig-leaf defence against accusations of anti-Semitism," stated Stand for Peace, a UK-based anti-extremism group. "In 2006, the sect’s UK branch leader Ahron Cohen stated that the Holocaust dead 'deserved it'. Similarly, Cohen was present at Iran’s Holocaust Denial conference in 2006 – paid for by the Iranian foreign ministry –[where] he was warmly greeted by Mahmoud Ahmadinejad, the Iranian President and infamous supporter of terrorism. One fellow speaker at Iran’s conference included David Duke, former 'imperial wizard' of the white supremacist group the Ku Klux Klan." "…a hardline revolutionary organisation based on an underground cell-structure similar to that used by both the Islamic Resistance Movement (Hamas) and the IRA…[...]"
Neturei Karta opposes the existence of the State of Israel based on the assumption that an independent Jewish state prior to the coming of the Jewish Messiah is sacrilegious. It has regularly aligned itself with extremist Islamist groups, including Hamas, Hezbollah and other terrorist organizations. Just yesterday, a Neturei Karta member was sentenced to four and a half years in an Israeli jail for volunteering to spy for Iran and "kill a Zionist".